AArk has offered grants since 2009 and in the past these have been predominantly seed grants, for newly created ex situ programs, for species that have been assessed as in need of urgent ex situ rescue. In 2018 our grants program was expanded, to include a wider range of programs types that are eligible for funding, as well as some new guidelines and requirements for grant recipients. Download the complete guidelines here. Start-up grants – initial funding to help newly-launched projects get started at the very beginning of their life, to help them attract larger and/or long-term funding for the duration of the program. We will not fund projects that are already well-established or have significant funding, although we will consider projects with funding in place for complementary components (such as fieldwork or education). One-time grants of up to US$5,000 are available. Recipients are able to apply for second and third year extension grants. Start-up grant extensions – additional funds are available to provide continued support for AArk seed or start-up grant projects that a) have met their stated objectives for year one, and b) can demonstrate that additional supplemental funds have been secured for years two and three. Recipients of funding from the AArk in 2016 and 2017 are eligible to apply for these extensions. Grants of up to US$4,000 for year 2 and US$3,000 for year 3 are available. Workshop attendance – partial funding to assist attendance at ex situ amphibian conservation-related workshops, especially those which focus on amphibian husbandry, planning and reintroduction. Applicants must have already secured partial funding to attend the workshop. You must already be actively involved in an amphibian conservation project or have well-developed plans and funding in place to implement a new program Grants of up to US$750 are available. Mentorship grants – support for organizations which have previously received an AArk seed or start-up grant, to bring in a designated outside expert to assist with an aspect of their amphibian conservation efforts (e.g. veterinary training, environmental control etc.). Grants up to US$1,500 are available. Emergency grants – limited funding is available for past recipients of AArk grants throughout the year for emergency situations such as emergency rescue of wild populations facing imminent threat of extinction, unanticipated major equipment failure in existing ex situ programs etc. Please download the Emergency Grants Guidelines or contact grants@amphibianark.org at any time to discuss an emergency grant. All applicants are required to submit a brief Project Outline, prior to submitting a full application. Your Project Outline should be less than 200 words in length, and should contain information under the following headings: Species, Organization, Project Manager, Goals, Proposed Outcomes and Other funding Sources (both requested and received). Project Outlines will be reviewed and successful applicants will then be invited to submit a full application. Full applications will not be accepted without a Project Outline having been submitted and approved by the review committee. Our grants are intended to support conservation projects for amphibian species that cannot currently be saved in the wild, with a focus on ex situ actions, and in partnership with appropriate field activities. Preference will be given to projects for species which have been assessed as in need of ex situ rescue or research work, either as a recommendation from a Conservation Needs Assessment (www.conservationneeds.org) or a similar, national assessment process. Past recipients of AArk seed grants can be found on the Grant Winners page. Federico Kacoliris, coordinator of the Wild Plateau Initiative, talks about their conservation work for the Valcheta Frog, a Critically Endangered species from Argentina. In 2011, Sao Paulo Zoo in Brazil received an AArk Seed Grant for the conservation of the Alcatraz Island Tree Frog. Cybele Lisboa talks about how the grant has helped their program. In 2015, Santacruz Zoo in Colombia received an AArk Seed Grant to establish a breeding laboratory specializing in Pristimantis species. Kelly Paola Prieto talks about how the grant has helped their program. Names, institutional affiliations, and email addresses of project leaders. Total funding amount requested from Amphibian Ark in US$. Executive summary (300 words or less), including brief background, methods, and anticipated outcomes, with emphasis on actions utilizing AArk funds. Please stress the conservation significance of the work, including the specific conservation need of all species involved (e.g., AArk priority, IUCN threatened or DD, national priority, etc.) and how the work will help address the threats to the species. Budget with distinction between funds requested from AArk and those from other sources, with the latter specified as ‘requested’ or ‘received’ and from where. Clearly identify the role of AArk funding as a proportion of overall project cost. All costs should be in USD$. Budget should be less than one page. See sample in Grant Guidelines. Timeline of work and intended dissemination of results. See sample in Grant Guidelines. Scientific citations are not necessary but limited to half page if included. All applicants – whether applying as individuals or as employees representing their organizations – must include at least one (preferably two) letter of endorsement from someone at an unrelated organization. That person should be a recognized leader in the field or at least from an internationally known organization. Employees representing their organizations must also submit a letter of institutional support from their employer. This letter is to verify that the employer (1) is aware that the applicant is proposing the project and (2) will provide the necessary resources, time and space to complete the proposed work for the duration of the project. Please address these points, with details of how this will be achieved. One such letter is required for each project leader on the application who has a different employer. See sample in Grant Guidelines. The project must include an ex situ component. While we highly value in situ conservation, research, assessment, and education, our funds are extremely limited and so we must insist that all proposals include an ex situ Note that in situ conservation, research, assessment, and education can be included as valuable components of any good proposal that otherwise focuses on rescuing species ex situ. Priority will be given to projects for species that have been recommended for ex situ rescue during a Conservation Needs Assessment. Check the Species Recommended for Ex Situ Rescue report at http://conservationneeds.org/SpeciesRecommendRescue.aspx for a list of priority species in your country. Field work. As long as your proposal details the ex situ components that are already in place, up to 20% of the funds applied for can be used to support the acquisition of founder animals, however priority will go to proposals in which 100% of the funds are directed to the ex situ facility. Ideally, our support of your ex situ component will help you secure funds for these other components as we tend not to fund components for which other funding could be found. For projects that do not relate to ex situ rescues, consider contacting the Amphibian Survival Alliance (www.amphibians.org/contact/). Include information about major threats to the species, the species action plan, partnerships with relevant stakeholders, biosecurity, habitat protection, plans for reintroduction of animals back to the wild, post-release monitoring and program exit strategy. Linking with in situ partners – all ex situ conservation programs should be planned in conjunction with appropriate actions in the field to mitigate threats, rehabilitate suitable habitat for reintroductions or translocations, and protect the habitat into the future. Include information about in situ partnerships and conservation actions being planned or underway. A copy of a Species Action Plan for the species, or other planning document which includes reference to the project, specific objectives and timelines for meeting those objectives. The plan should have been developed in conjunction with all relevant stakeholders, including those working with the species and/or it’s habitat in the wild. Inadequate planning is one of the biggest causes for the failure of amphibian conservation programs, and we expect to see appropriate planning in place prior to a program being implemented. A Species Action Plan template is available on the AArk web site, as are existing species-specific action plans for reference. If your proposed program is to work with an analog species prior to working with a related but more threatened species, your proposal should be for the threatened species, and include details about the selected analog. Working with amphibian species that need to be rescued. Proposals must relate to rescuing species whose threats cannot be mitigated in nature in time to prevent their extinction and which therefore require urgent ex situ intervention to persist. This status should be determined by relevant field experts, e.g., the IUCN/SSC Amphibian Specialist Group field experts through AArk Conservation Needs Assessment Workshops, or similar national processes. The IUCN Red List can also be used to verify the threatened status. While we appreciate efforts to keep regionally threatened but globally stable species common, our limited funds are restricted to projects involving species that need help at a global level. Working with species within their native range country. Unless capacity absolutely cannot be built in the range country in time to prevent imminent extinction, the AArk will not fund projects that remove animals from their range country. In addition, every effort should be made to enable national biologists to lead the program. Adhering to recommended biosecurity standards. Regardless of where the rescue population is held, measures must be taken to isolate it from allopatric (non-overlapping) species that might be in the collection as well as from the original threat (e.g., chytrid), except where a valid scientific argument can be made to the contrary. Please refer to our recommended biosecurity standards. Introduction, identifying the main conservation problem, the proposed corrective actions, the anticipated outcomes, and how these relate to the AArk values. Include information about recommendations arising from a Conservation Needs Assessment (or other national assessment), mitigation of threats in the wild, habitat protection and eventual reintroduction and monitoring activities. Methodology, including a succinct description of the proposed work with enough technical detail for evaluation by experienced reviewers. Applicants need not submit a full grant proposal – please include a short summary of progress during the previous year, with a clear statement of how objectives from your previous grant application have been met, any updates to the species action plan, and letters of support from additional funders indicating the level of funding obtained within the last twelve months. To receive a third year of funding applicants should follow the same procedure as for year two. Outline methodology, including a succinct description of the proposed work with enough technical detail for evaluation by experienced reviewers. Include a letter of support from a recognized leader in the field who has visited the project within the past six months (AArk staff may be able to help arrange this – please contact us for advice, if needed). Include the name, dates and location of the workshop. Outline the funding received or committed to date to attend the workshop. Include a summary of the amphibian conservation project you are currently working with, including the species, progress to date, and future plans for the project. Describe the benefit of attending the workshop, and how the knowledge gained will be used. Include the name(s) of the proposed mentor(s), the institution(s) they are from, the expertise they will bring to your project and the length of time of their visit. If you need help to find a suitable mentor please contact grants@amphibianark.org. Outline the support provided to the mentor by the host institution (e.g. provision of accommodation, food, supporting travel costs etc.). Information about the species being managed, and whether it is native to the country the program is based in. Proposals should be submitted in English. The body of the proposal (including content points 1-6 above) must not exceed three pages, excluding budget (≤1 page) and literature cited (≤½ page). Proposals longer than five pages in body length will not be reviewed. All materials should be submitted together, as .doc or .pdf files attached to a single e-mail. File titles should include the name of the grant’s principal researcher. The two supporting letters should be sent as separate files. Only e-mailed proposals will be accepted. Submit proposals to: Kevin Johnson, Taxon Officer grants@amphibianark.org. All correspondence should have “AArk Conservation Grant Proposal/principal researcher’s name” in the subject line. Bank account details for the institution to be provided to the AArk within two weeks of being notified of grant approval. Signed Memorandum of Agreement (MOU) between the director of the recipient institution and the AArk within two weeks of being notified of grant approval. A copy of the MOU can be seen here. Send a brief progress report (e.g. newsletter article) and photos six months after funding received. Produce husbandry guidelines within six months of acquiring animals (using the Amphibian Husbandry Guidelines template). Existing examples are available on the Husbandry Documents page for reference. Submit a draft (or complete) action plan six months after funding received. Send a final progress report twelve months after funding received. Ideally, grants should be submitted at least one week before the deadline, so they can be reviewed, and returned for alterations if needed. Grants submitted on the due date cannot be modified and will be accepted as is. 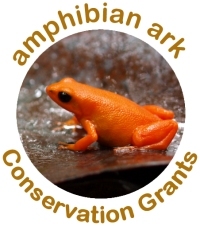 Applications and inquiries should be directed to grants@amphibianark.org. AArk staff are available if you need assistance in formulating your proposal. Please do not hesitate to contact us with any questions. Each year several proposals have been rejected due to issues that could have been prevented with a little extra guidance! We also have several past seed grant recipients who are willing to act as mentors, to help with your application – please let us know if you would like us to put you in contact with one of them. Email us at grants@amphibianark.org. We would like to acknowledge the generous support of AArk funders and donors who have helped to establish and support these grants.